Texting My Pancreas: It's Working. I've written about trying to get my A1C down. And I've talked about retraining myself on what "normal" is, BG-wise, so that I can be well practiced for "when that time comes". I've been trying to be a more disciplined diabetic - moderation, not elimination, as someone so eloquently put it. As I checked out the averages on my meter this morning, I have to cautiously think, "It's working!" At least, for now. 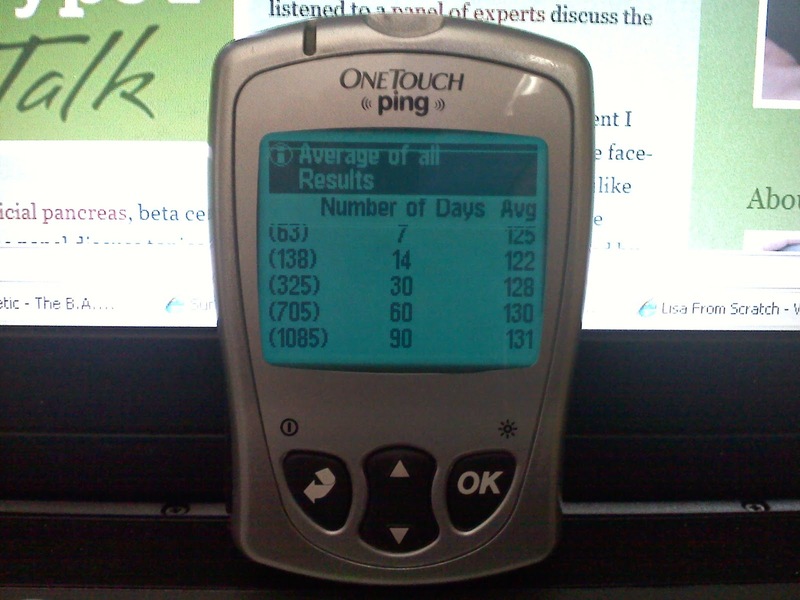 I still have work to do, but it seems as though the diabetes stars have been aligning for me lately. Some of it is carefully planning and diligence, but honestly, some of it is just plain luck. I'm hoping it doesn't run out any time soon. That is great to see!! Yippee! I'm happy for you. :) Any tips for those of us who would also like to see such beautiful numbers on our meters? Those numbers are great! Mine are coming down, too, but are still about 30 mg/dL higher than yours. (Of course, that's down 20 from earlier in the year.) You rock! awesome work, kim! :D thumbs up for you. Great work, Kim! Those are awesome averages that hopefully will lead to an A1C that makes you jump with joy! I've been trying to re-train my brain on what's "normal" and it's not easy, but very much worth it! Your hard work is paying off! Congratulations! Awesome ! Keep on riding that winning streak ! Great numbers -- glad to see things are going in the desired direction!